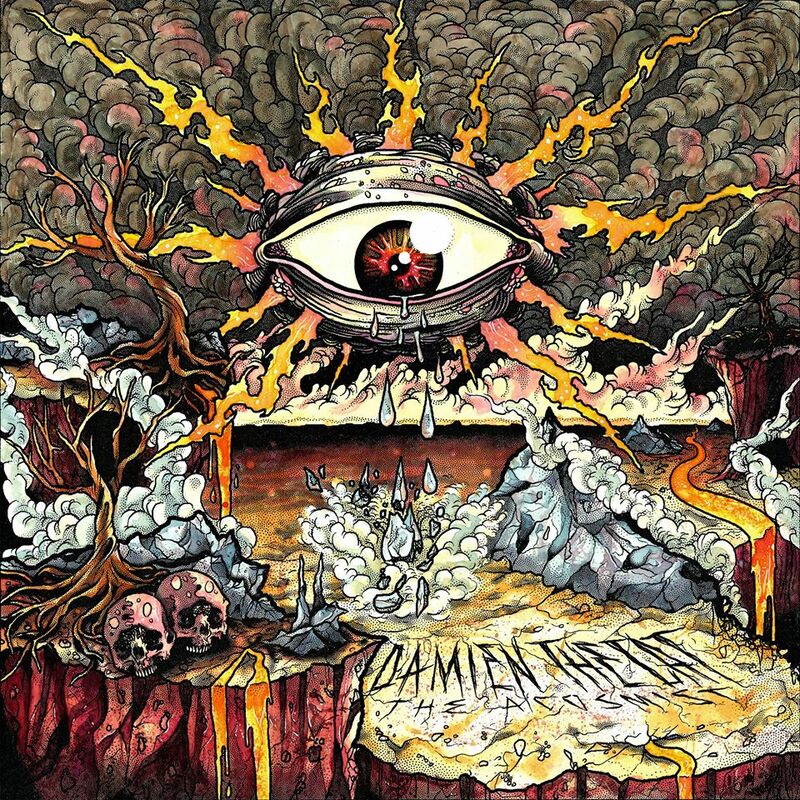 And Justice For Art: A Colorful Apocalyptic Vision: The Making Of Damien The Cat's "The Acosmist" Album Cover. A Colorful Apocalyptic Vision: The Making Of Damien The Cat's "The Acosmist" Album Cover. "The Acosmist" is the title of Damien The Cat's new recording. This genre-bending sonic experience (which mixes elements of Post Metal with other genres) is the result of two years of intense musical and lyrical soul-searching. The alluring strangeness of the material is accurately captured on its cover art, created by American illustrator Cruise Winger, who has collaborated with bands like As I Lay Dying, Dying Fetus, Whitechapel and others. This image proposes a colorful-yet-cryptic scenario of apocalyptic overtones. Below, drummer, Tom Weil, and guitarist, McCann Painter, delve deeper into the complexities of this hand-drawn piece of art. AJFA: Musically speaking, how important is this album for the development of the band's career? McCann Painter: Musically speaking, this is my magnum opus as of now. I'd say the development of the album itself, which spanned a rather sporadic two years time, and my growing musical education were very necessary to the development of Damien the Cat's career and my foray into more compositionally dense music. To all three members it represents a hope that this crazy genre-bending nonsense we write has some viability in today's scene. AJFA: Who came up with the cover concept and what inspired it? Tom Weil: Mac came up with the cover concept, and it was inspired by a tattoo (which was inspired by the lyrics) on his upper left arm. AJFA: Who’s the artist that painted this image and how he became involved with project? Tom Weil: Cruise Winger. We hired him! AJFA: What’s your personal interpretation of this artwork? How does this image represent the album’s music and lyrics? McCann Painter: This is the illustration of the harrowing dual sense of divinity and humanity as well as the guilt the protagonist of the album feels at the destruction of a world he once observed from within. It represents the philosophical climax of the album in which he realizes that nothing is separate from divinity and therefore, though he destroyed what many would describe as merely a computer simulation, understands himself to be a mass murderer, and bears the burden of the guilt which naturally comes at that realization. It represents the dreaminess and inner struggle which is prevalent in this album as it reflects my mental state in the process of writing and developing it. 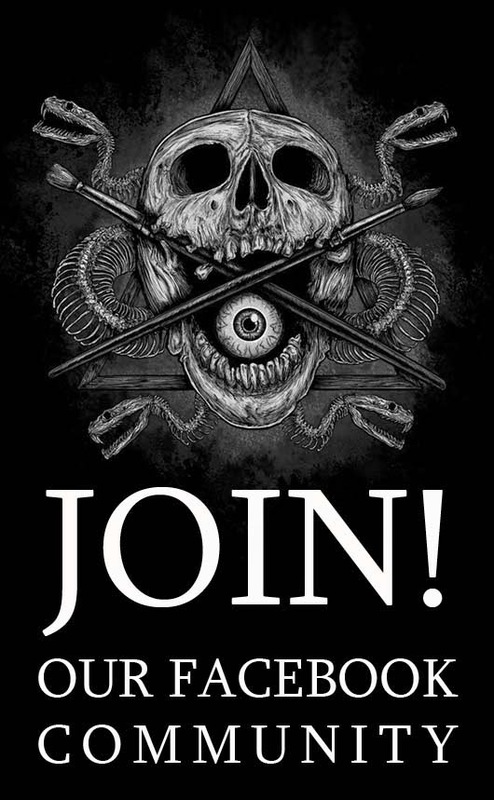 AJFA: There’s an obvious symbolism going on with the eye, the skull, the cloudy sky, etc.. Can you comment in detail about it? McCann Painter: The eye is gigantic, representing a knowing beyond the human condition. Each element represents a different aspect of our protagonist's suffering as he makes his journey through boredom, loss, delusion, realization, and the tale's conclusion. AJFA: What was your first reaction to the finished artwork? Tom Weil: Our heads exploded! We were overwhelmed, because though we envisioned something so grand in concept, nothing could prepare us for what Cruise cooked up for us, and we were simply overjoyed upon receiving it. AJFA: Where's the original art? Tom Weil: I suppose it's in Mr. Winger's possession. Though this now brings up the consideration of asking for it to have it framed! With his tremendous present for discussion and discreetly attentive narrating, Bottoms draws us into the universes of such figures as William Thomas Thompson, an impaired ex-tycoon who painted a 300-foot variant of the book of Revelation; Norbert Kox, an ex-individual from the Outlaws biker group who now lives as a loner in provincial Wisconsin and paints whole-world destroying visual anecdotes; and Myrtice West, who started painting to express the life-changing dreams she had after her little girl was mercilessly killed. Massive post. Really good-looking blog. A lot of blogs, I observe these days don't really present anything that I'm interested in custom essay writing help .but I'm most definitely interest in this one. I am in reality happy with article quality and direction. This post is mark on in helpful how some thought apply to any script point. Thanks a lot for protection enormous things. Your cover concept is pretty amazing! I was searching on Evolutionwriters testimonials for something like this. Sadly I didn't find anything appropriate. This post is mark on in helpful how some thought apply to any script point. Thanks a lot for protection enormous things. you the first-class carrier, there's to make you sense glad. each of our escorts is lovely and versatile of their methods so irrespective of your goals are, you will get them fulfilled right here.